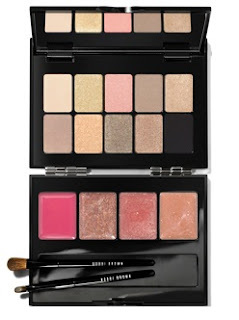 An online exclusive, Bobbi Brown's Bellini Lip and Eye Palette ($75) looked irresistible. Bobbi's toast-of-the-town collection, named after one of my favorite drinks, features an array of colors for lips and eyes in a mirrored compact. Ten eye shadows in mix-and-match textures create shimmering, light-catching looks. A quartet of sheer lip gloss colors completes the bubbly mood by adding glittery depth and high shine to the lips. The palette includes a mini Lip Brush and mini Eye Shadow Brush. I ordered one the instant I saw it at Bobbi Brown's Web site. The pastel shadows appeared to be perfect shades for office wear - and they are. 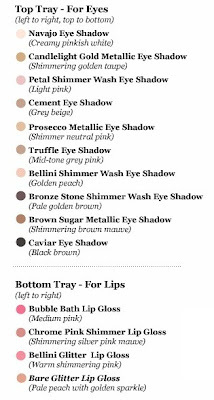 The shades, cut from Bobbi's Web site are shown below. Don't forget to click on the photo to enlarge it. I was able to get photos over the weekend - not in full sun, but quickly as high clouds moved in, as predicted. As a result, my photos aren't great. Even with full sun, though, some of these pastel shades would have been difficult to photograph on my pale arm. I applied all the shades with a sponge-tipped applicator, trying to ensure I applied enough shadow to show. The top row shades are shown above from left to right. You won't be able to see Navajo, a creamy pink-white at the top of my arm. It matches my skin so well, I couldn't see it as I applied it. It's the perfect base shade! The shades, starting with those you will detect are, from top to bottom, Candlelight Gold Metallic, Petal Shimmer Wash, Cement, and Prosecco Metallic (totally gorgeous). Naturally, you need Prosecco, the Italian bubbly for your Bellini. I'm surprised there isn't an orange lip gloss in the palette since you need orange juice too. The bottom row in the palette is shown on my arm immediately above. Truffle, at the top of my arm, is a greyed pink. It actually looks great on the eyelids, even though I cast a critical eye at it when I swatch tested it. It provides a nice base for lavender-toned shadows. The three shades below it are dazzling: Bellini Shimmer Wash, Bronze Stone, and Brown Sugar Metallic. Caviar Eye Shadow is shown in a thin line at the bottom of my arm. The Lip Glosses are all very sheer. From top to bottom, I applied Bubble Bath, Chrome Pink, Bellini Glitter, and Bare Glitter. All have enough pigment to be seen, but not enough to be worn on their own as "lip color." The little brushes are handy, even though I wouldn't use them in my bathroom for daily application. For on-the-go tools, they are fabulous. I think this is a lovely palette. I'm glad I purchased it at Bobbi Brown's Web site, where it is still available. I remember reading that it would appear at Bobbi Brown counters, so if you miss it online, you'll have a chance to see it in person to decide if it's a must-have for you. Totally agree. With more lip color in the glosses, it would be a 10! It really is, JEM! It doesn't photograph well, at least it didn't for me, but it's gorgeous. So wearable! You are too funny, MamaVal. The best palette in ages. Perhaps another get-well gift? I love Bobbi Brown! That said - the one thing that makes it a bit easier for me to pass up on the multiple palettes she puts out is in the inclusion of some of the same colors over & over. Navajo, the de rigueur Bone, Cement, Caviar, and a few others always seem to show up in her palettes. Yes, they are great, very useful colors but I don't need them over & over again! 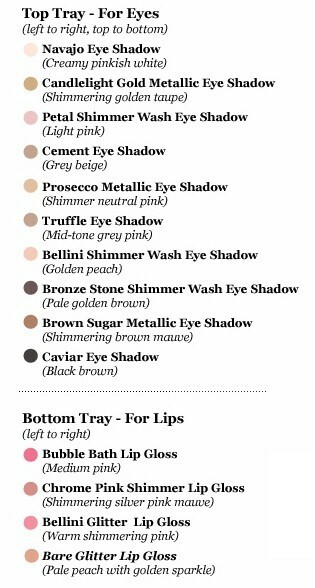 That said, if someone was new to BB or new to makeup in general this would be a great palette to begin with! i agree with lovethescents. great eyeshadows, but as i get older, i prefer a lipstick with colour to give my face a lift. Hi Lov2read, that's why I've got palette fatigue. I want more than two or three new shades in a huge palette.